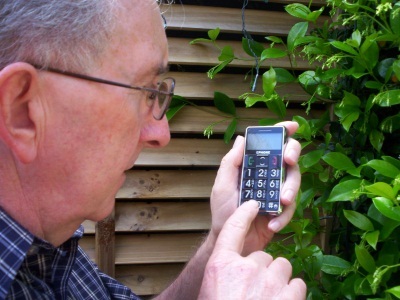 Seniors Phones - Our BIG SIZE KEYS Make phoning a BREEZE! At Seniors Phones our aim is to make life easier for our senior population who may be struggling with either the latest technology of mobile phones or just the day to day use of their basic home phone. We understand that as we get older, our eyesight fails or our fingers become arthritic and we struggle to see and use those tiny buttons. BIG BUTTON home phone with SpeakerPhone allows you to be "hands free" when making or receiving a call. Hearing Aid compatible (just switch your hearing aid to the "T" setting). Safety feature - will still work even if the power fails. SO EASY.....Just plug out your old phone and plug in the new one! save precious seconds in an emergency. Our BIG BUTTON mobile phone is just the best gift for grandparents, elderly relatives and friends, who may not have got on board the mobile phone technology. Give them SECURITY and INDEPENDENCE. This phone is so EASY to use and is basically "just a phone"
The best part is the emergency SOS button which will contact 4 people of your choice (or your Doctor or ring 000). If you are unable to speak, a text message is automatically sent to each person notifying them of your emergency, just activate wherever you are with your phone! At Seniors Phones we realised that there are not a lot of devices available that are aimed at helping our senior population keep in touch with loved ones and their support base. Most of the current technology is aimed at the younger generation and everything just keeps getting smaller, not ideal for those of us with eyesight or hearing that is starting to wane.